This is the straight needle version of this pattern. The in-the-round version is available here. Repeat sections between * across the row. Cut the yarn with several inches to work with. With a yarn needle, pull the yarn through all the remaining loops, secure and weave in end. Seam edges together. Thank you SO much for sharing this beautiful pattern!! I am 60 and bedridden. Knitting is now my passion and this little hat will be a joy to knit. You have made my life a little brighter today!! This would look lovely on an adult. How do I adjust the pattern to fit an adult (small)? Thanks in advance! A cast on of 112 should be the only adjustment you would need. I am so sorry I’m just now getting back to you on this. You should have 80 stitches after row 3. There are two increases in each repeat, and for that size, there are 6 repeats, so you are increasing 12 stitches. Can I use size 6 circular needles? Also would the sizing change if I use a medium weight yarn instead of the one you have used? 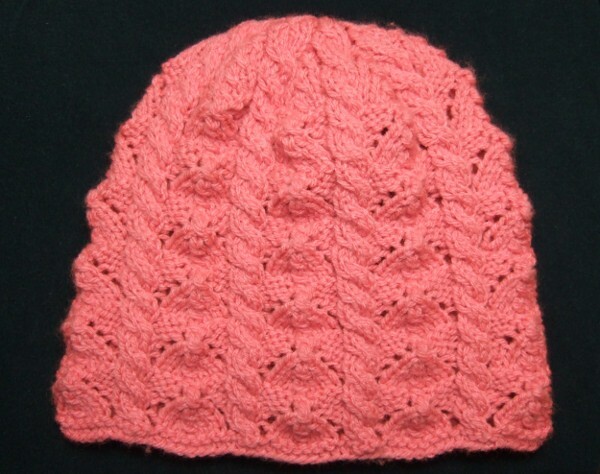 You can use circular needles and just knit back and forth. The medium weight yarn will probably increase the size a bit, so you might want to cast on for one size smaller.